To be a great Penn State fan, one must know the codes, the cheers, the songs and the atmosphere of the game. However, as a freshman or a new comer to the university, there is a campus group that is helping them acculturate into the Penn State community. Penn State PRIDE, or the Penn State Sportsmanship Team, is a student organization dedicated to help provide and create a positive atmosphere for all fans that attend Penn State sporting events. According to the club’s president Bridgette Carrier, a senior majoring in Kinesiology, the group started at in 2005 to help stop the visiting team and its fans from saying that Penn State fans are giving them a bad experience. The group disbanded in 2006, was re-founded in the fall of 2009, and was relaunched in fall 2010. There are currently 18 members and the group is continuing to grow. 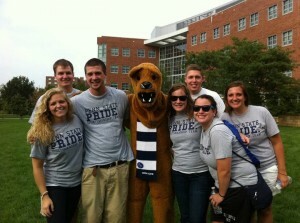 Penn State Pride is paired with Nittanyville, Nittany Nation, and the Student Athlete Advisory Board. Caitlin Rush, senior in Marketing and Public Relations with a minor in International Business and Business Law and director of Public Relations for Penn State Pride, says that the group wants to work with Penn State fans to help answer some questions about the history of the school and some of the school’s traditions. The Sportsmanship team has a website that shows information about the club and has a place for fans to blog about the games, stadium and atmosphere. Please check out the group at PSU PRIDE. Matthew Todd Vine is a 2011 Penn State University graduate, with a B.A. in Journalism. He loves to travel and get to know new faces. He loves everything about Penn State and the community that surrounds it.